Before we begin, just know, this is all simple in theory, but difficult in practice. Start off with whatever you consider "affordable" risk. For the sake of this thread we will just say $50. You have to treat it like digging a hole to find the buried treasure. wins make the hole deeper.Losses make the walls of the hole cave in. 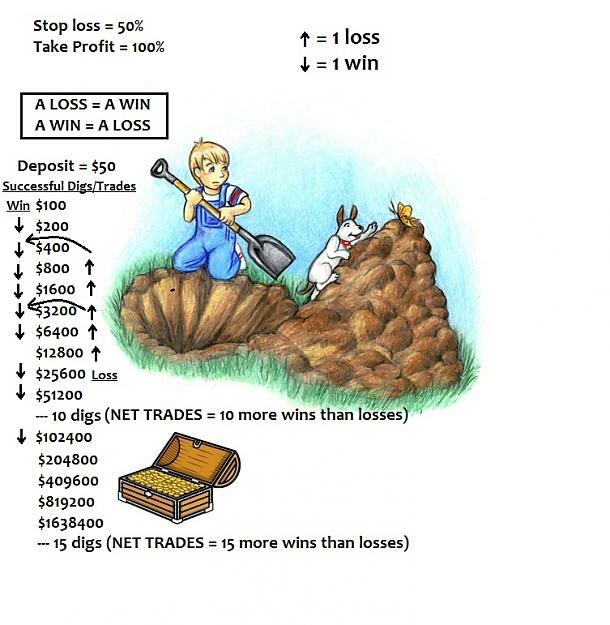 When you use a 50% stop loss and 100% take profit, a losing trade will only cause you to lose the profit you made on the last trade. When you scale your leverage down to compensate for the loss, a winning trade will get you back to where you were before the last trade. This is why you shouldn't think about the money, but think about the Net Winning trades (NWT). What is a NWT? It simply means how many more wins you have had than losses. If you have 9 Net Winning Trades, scaling up after each trade, you will make a 100,000% gain. You get the point? As long as you get those 9 Net Winning Trades, you will make a 100,000% gain. If you use 300:1 leverage, 17 pips is your stop loss. Your target is 34 pips. 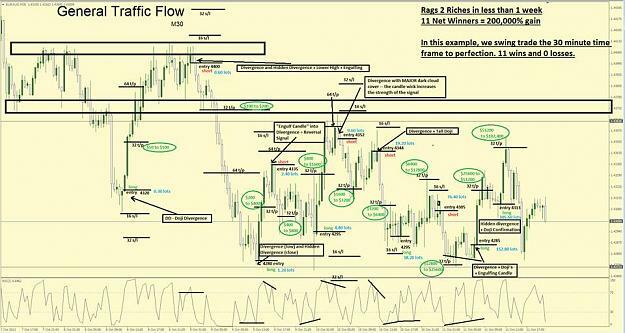 If you use 200:1 leverage, 25 pips is your stop loss. Your target is 50 pips. If you use 100:1 leverage, 50 pips is your stop loss. Your target is 100 pips. If you use 50:1 leverage, 100 pips is your stop loss. Your target is 200 pips. After reaching $50,000 (or whatever you feel comfortable with), you should start trading lower leverage and lower risks. Here is what I would do, but you can do whatever you want. b) i would take the $40,000 and attempt +to make 20% gains every month, which would give me around $400,000 at the year end, and after taxes i would have roughly $300,000 remaining. Account balance = $50, giving two attempts to get going. The order of the wins and losses doesn't matter. This thread is open for discussion, feel free to ask questions or make observations..